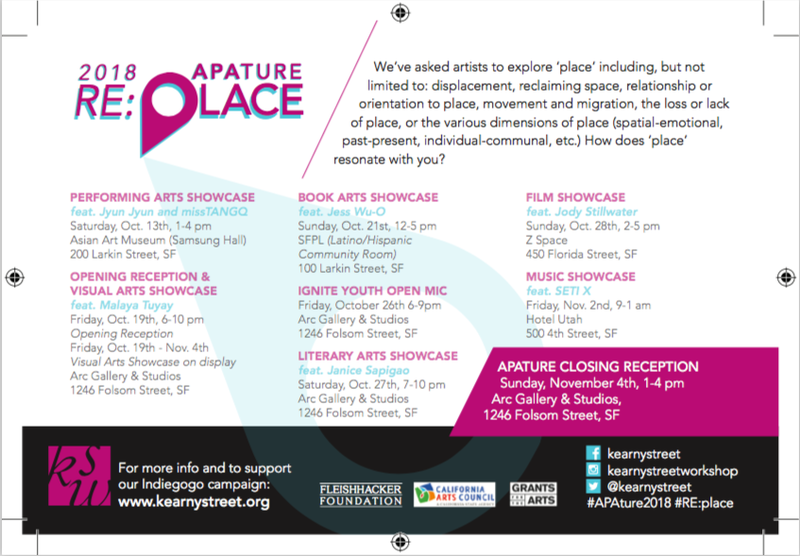 This is Kearny Street Workshop’s annual multidisciplinary arts festival celebrating emerging Asian and Pacific American (APA) artists of the San Francisco Bay Area. For 16 years, APAture has been a site of dialogue, collaboration, and political action between artists and community members around contemporary issues affecting the Asian and Pacific Islander community. This year we’ve asked artists to explore ‘place,’ including but not limited to: displacement, reclaiming space, relationship or orientation to place, movement and migration, the loss or lack of place, or the various dimensions of place (spatial-emotional, past-present, individual-communal, etc.). How does ‘place’ resonate with you?